Network Ten commentator Liz Ellis joins Talkin’ Sport from Glasgow on July 24. Wests Tigers player Mitchell Moses joins Talkin’ Sport on July 25. NSW Waratahs Benn Robinson speaks with Talkin’ Sport on July 25. Sydney Roosters coach Trent Robinson with Talkin’ Sport on July 22. Roy Masters joins Talkin’ Sport on Bennett’s shock move to the Broncos. Collingwood FC President Eddie McGuire with Talkin’ Sport on July 18. Newtown Jets Director Terry Rowney speaks with Talkin’ Sport on July 17. Bulldogs & NSW Blues star Trent Hodkinson joins Talkin’ Sport on July 17. 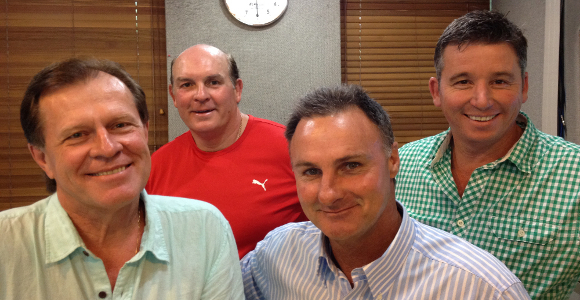 Robbie Slater gives Talkin’ Sport his 2014 World Cup verdict on July 14. Wests Tigers’ Liam Fulton speaks with Talkin’ Sport on July 11. Fox Sports Australia commentator Simon Hill with Talkin’ Sport on July 9.